Writers' camp was developed to help writers reach their goals. 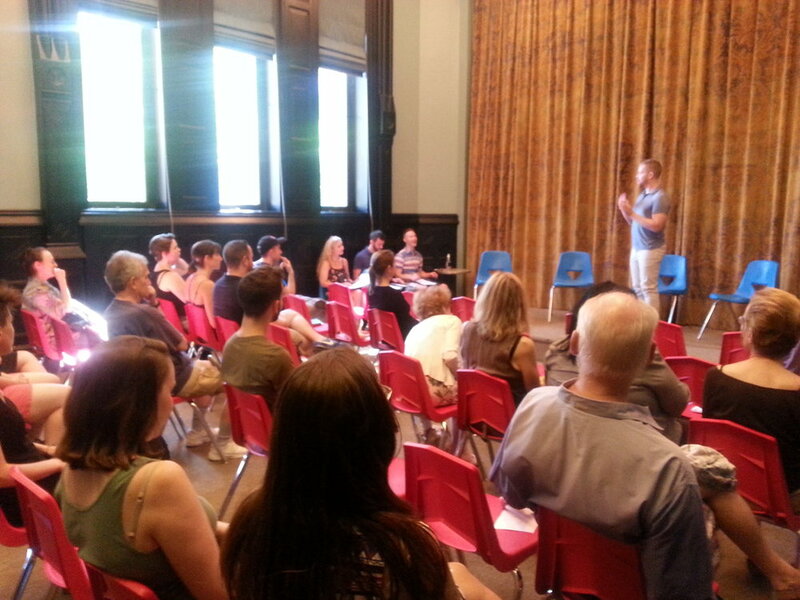 We meet on a weekly-basis for events that develop our craft, career and community. Events range from a Q&A with a literary agent to a potluck where everyone shares their favorite dish and their favorite story. 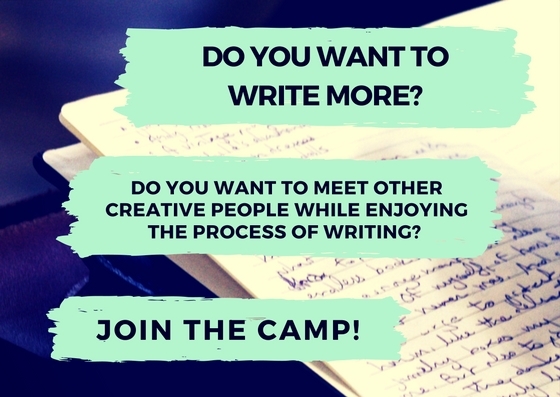 If you're looking to meet other writers, if you want to be held accountable, if you want to have fun reaching your goals, sign up for the next camp! Choose Astoria on Saturdays or Brooklyn on Sundays. Times and locations vary based on the event. All genres, styles and experience levels are welcome. Membership includes online writing group, limited-edition journal,one-on-one feedback, classes, and a public reading of your work. Space is limited - apply early! Contact Tracy@writerswork.org if you need to apply for financial aid. You're tired of writing alone. You need some structure and routine with your writing. You need help staying accountable. You want to have fun with like-minded people. You've never done anything else like this. Brainstorming sessions for your work. Weekly emails with writing prompts and motivation. Most events take place in Queens on Saturdays or Brooklyn on Sundays. You're encouraged to go to all events, but not required. Times may change based on the venue's availability. The exact time will be announced on the Monday prior to the event. You can get a full refund if you cancel a week before camp starts. No refunds after that point. Meet the rest of the camp, discuss goals, brainstorm ideas and get started on a project. Use the writing time to work on your own writing, or get started with a writing prompt. You'll be amazed by how much you can accomplish in the company of other writers. Bring your favorite dish and your favorite story. We'll enjoy the beautiful weather while sharing our writing and food. If it rains, the potlock will be moved indoors. Sometimes the best way to free up your creativity is to go outside and enjoy some fresh air. We'll be taking the Metronorth for a fun day of apple picking outside of the city. *note: The Brooklyn and Astoria camps will blend for this special outing. Transportation costs and orchard fees are not included. This is a chance to get thorough feedback on up to 20 pages of your writing! You'll be partnered with someone in the group for this activity. After reading each other's work, you will meet to discuss your thoughts. I'll provide a guide for a critique, you provide the feedback! Writers Work is known for its fun writing classes. This event is no exception. Get ready to learn new skills and new approaches to your writing. Take a new approach to your story by thinking about the cover. We will be hearing from the design department of a major publishing house on how they come up with the cover, what you as the author can control, and how thinking about the design can help solidify your story. Learn some of the literary history of your borough during this interactive tour. Get ready to hear some of the spookier tales of writers in NYC. Readings are not just for published authors. This is an incredible form of motivation and a great way to share your work with your friends and family. Invite everyone you know to hear what you've been working on and get ready to hear some praise! The Creative Web is an online forum with fun writing prompts. Receive tons of feedback on your writing while meeting writers from all over the country. We provide you with a beautiful, limited-edition journal to house all the writing you'll be doing during this camp. ← Back to Join a writer's community. Have you tried writing with other writers? It's the best! 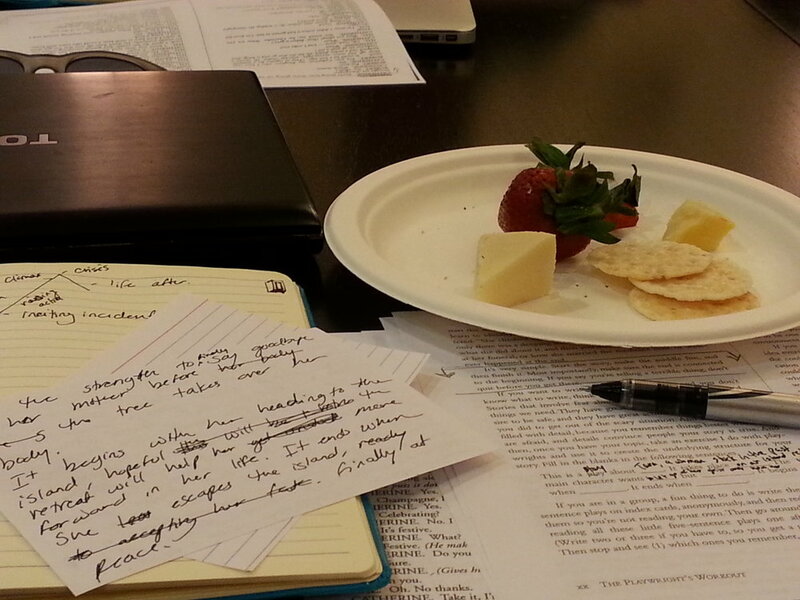 At these meetings, we write for 45 minutes, take a break to discuss challenges and successes and then write again. 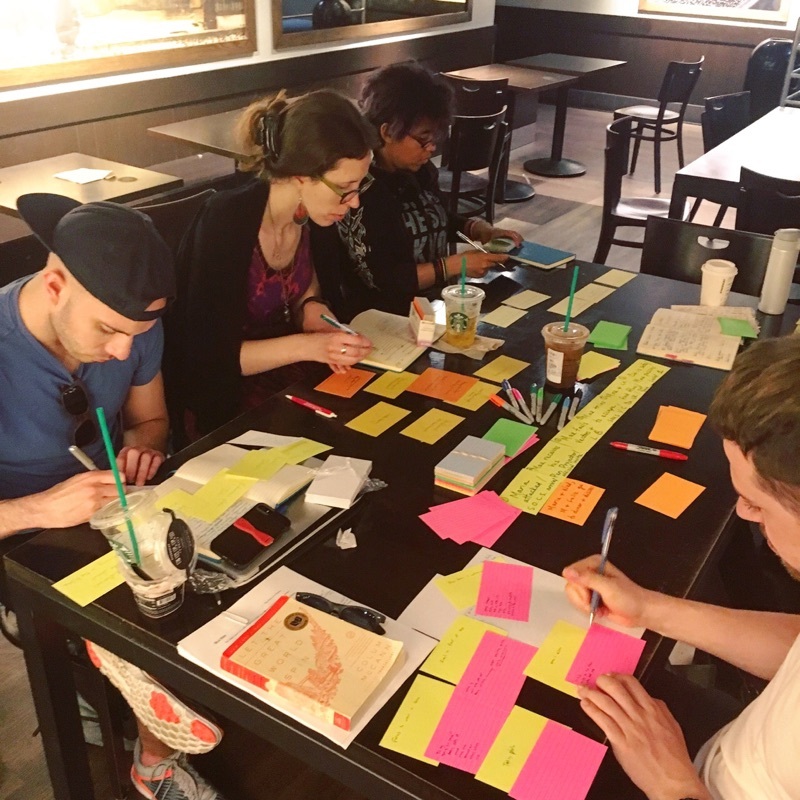 It's a great way to get work done, enjoy some social time, and brainstorm ideas. We meet in unique cafes all over the city so it's also a chance to find new creative spots. Sometimes getting away from the computer is the best way to inspire your writing. Spend the day out of the city, picking apples, sipping on cider, and a special apple-inspired writing exercise. * Transportation and site fees (approx. $30) are not included in the cost of fall membership. Bring your favorite dish and your favorite story. 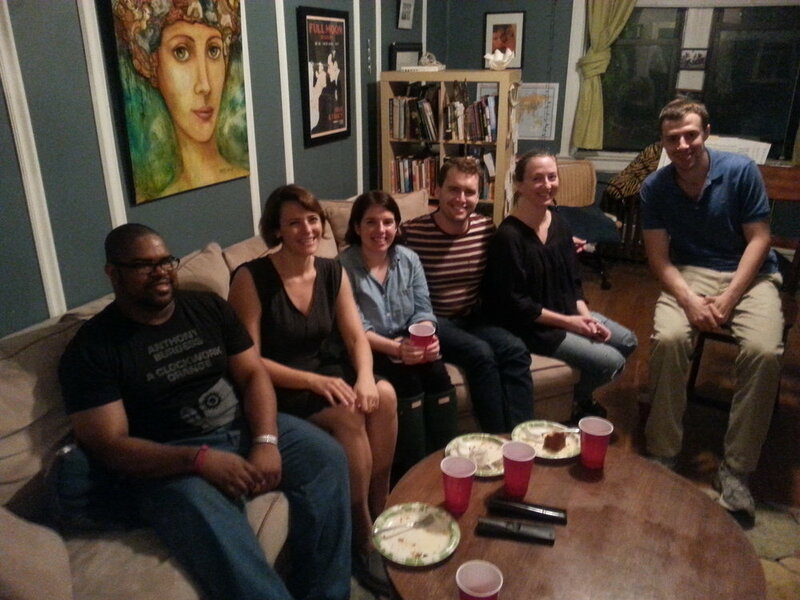 In a fun casual setting, get to know each other's writing while enjoying some delicious food and wines. Share some haunted tales while walking the hallowed streets of Manhattan to see where some of the spookiest writers lived. One of the best ways to get inpired is to be outsdoors and practice total presence. Smell the earthy leaves, listen to the distant saxaphone playing, fell the crisp air. I guarantee yu'll return home with the new ideas. Another day, another cafe. Let's see how much we can write together. Bring your laptop or your journals and write write write! And if you get stuck, you're in luck, you'll be surrounded by other writers who can help. Readings are not just for published authors. This is an incredible form of motivation and a great way to share your work with your friends. Invite everyone you know to hear what you've been working on and get ready to hear some praise!